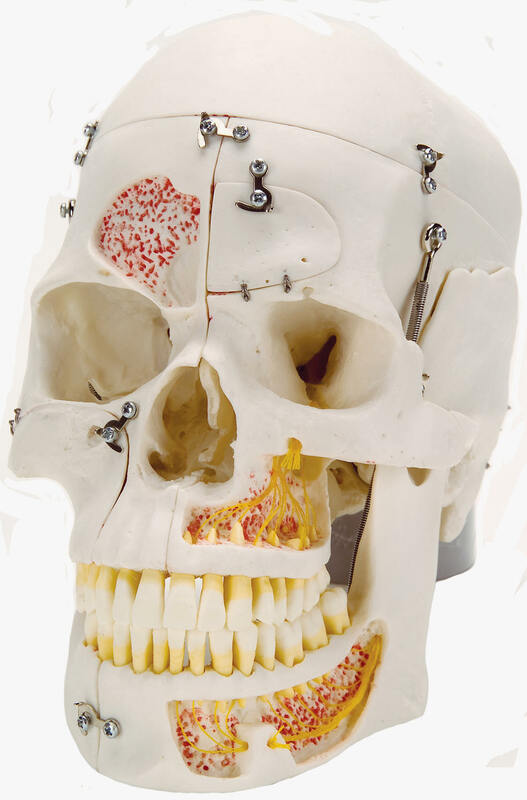 High-quality plastic skull replica showing extraordinary detail. Cast from a specially prepared natural specimen. All 32 teeth are faithfully reproduced and are individually removable. A hinged flap on the right side discloses the roots of the molars and premolars. These features make it especially useful for dentists. Color is used to highlight the sinuses and semicular canals, and to trace cranial nerve tracts and the arteries and meningeal sinuses within the cranium. The skullcap is removable and the base of the skull is midsagitally divided. The frontal sinus, perpendicular lamina and vomer are fitted with flaps which can be opened to view the lateral nose wall and sphenoidal sinus. The skull divides into halves along the mid-sagittal plane. The perpendicular plane of the ethmoid and vomer is hinged to expose the sphenoid sinus. On the left half, the temporal bone can be removed and folded up in the area of the tympanic membrane. 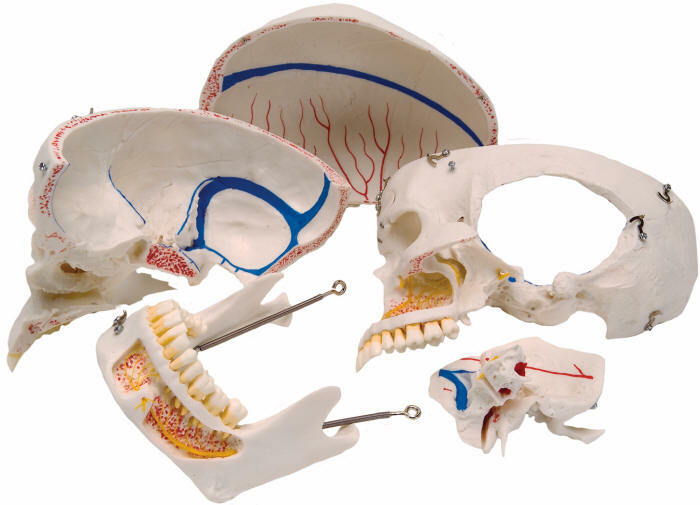 Maxilla and mandible are opened to reveal the alveolar nerves. On the right side, the temporal bone is opened to reveal the sigmoid sinus, the facial nerve canal and the semicircular ducts. Additional flaps are located at the maxillary sinus and the right half of the mandible, so that the dental roots of the premolars and molars of the lower jaw can also be viewed.